When the Wu-Tang Clan first announced that it was selling a one-off album to the highest bidder back in 2014, techradar thought it was merely a PR stunt to steer people away from the lukewarm reviews of the group's sixth album A Better Tomorrow. But someone has actually gone and bought the thing for 'millions', according to Forbes. The double album, titled Once Upon A Time In Shaolin, is a one-off printed LP that has sold to a private American collector. The purchase of Once Upon A Time In Shaolin makes it the most expensive album ever made. While no one knows the exact cost, it's thought to be around $5 million. Ouch. Rza, cofounder and Wu-Tang's producer, has revealed that a large chunk of the money will go to charity and explained that the reason the group went with the one-off concept was to push boundaries. "The Wu-Tang Clan have always been driven by innovation, and this marks another moment in musical history," said RZA. "From the beginning, we hoped that this concept would inspire debate and new ways of seeing creativity. Both of those goals have been achieved, and the ideas continue to evolve." 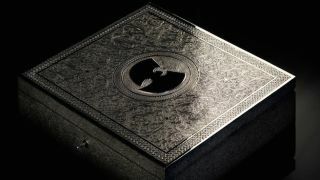 The album comes in an engraved silver jewelled case, contains a 174-page leather-bound manuscript and a pair of PMC MB2-XBD speakers have also been thrown in at a cost of around $55,000. Now that the album has been purchased, all the backups of the LP have been destroyed and the buyer isn't allowed to release the music for a grand sum of 88 years. Let's just hope the album is filled with tracks as good as CREAM, rather than 31 variations of the intro skit to Method Man. Missed out on spending millions on the new Wu-Tang record? Then maybe try Apple Music.